In the good news story of the year, the stranded junior Thai Football team known as the ‘Wild Boars’ have finally been rescued today. 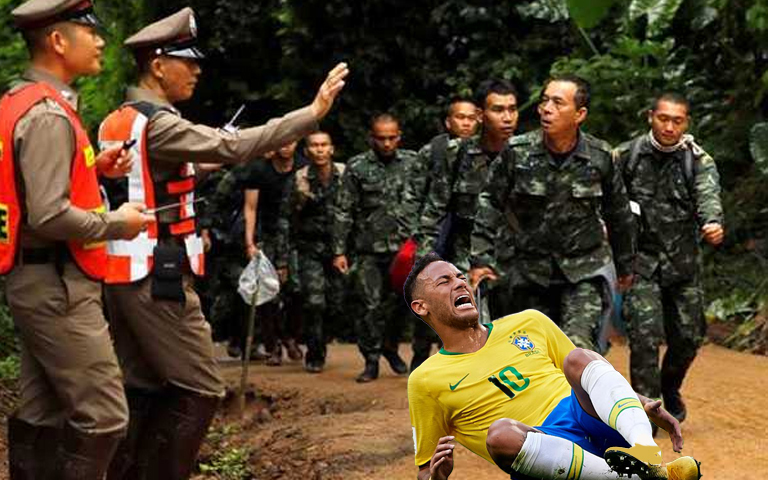 Thai Authorities have thanked all those involved in the rescue operations and extended a special thank you to Brazilian footballer and expert diver Neymar. Neymar da Silva Santos Júnior (commonly known as Neymar) who featured for Brazil at the World Cup only days ago, was flown in by the organisers of the rescue efforts after being impressed by his antics on the pitch. Neymar drew the ire of many fans around the world after his Oscar-winning performances in Russia after minimal contact. However, that has all been forgotten now as the flashy Brazilian is being hailed as a lifesaver. The most expensive player in the history of football (commanding a whopping $350 million upon his transfer from Barcelona to Paris Saint Germain) provided more than just publicity during the operation, with his diving efforts crucial in making sure the 14 boys and their coach came out alive. Chiang Rai Governor Narongsak Osatanakorn told a scrum of international and local reporters that the country is forever indebted to Neymar. “The boys, the rescue team, the nation of Thailand. We are all in debt to Mr Neymar,” Mr Osatanakorn said. Neymar then told the crowd that it was the least he could do, before informing the international reporters that he wouldn’t be able to stay and celebrate with the boys, as he had to be on the first flight out of the country to compete in qualification for the 10M Platform at the 2020 Tokyo Olympics.